High quality British made Titanium (6AL-4V) with top quality anodising and polishing. These Titanium belly bars are also available with 6 - 14mm length shafts. Suitable for initial body piercings. All Titanium belly bars are set with Swarovski crystals of which we carry 15 colour options. 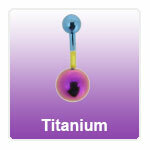 We offer anodised Titanium belly bars in a huge range of anodised colours. "Very fast delivery, everything looked exactly like it did on the website and fits perfectly. Very happy, will definitely order from here again." "Excellent service & Excellent jewellery"